The Teenage Mutant Ninja Turtles have been a family favorite for DECADES. I loved them growing up. My younger cousins adored them and now my children can’t get enough. 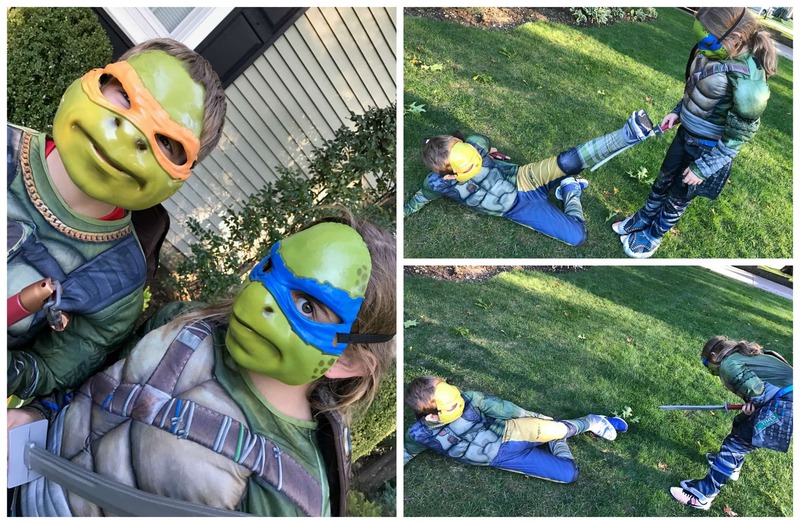 We love these pizza-loving crime fighters on TV, so it makes complete sense that my children wanted to dress up as their favorite heroes in a half-shell this season. 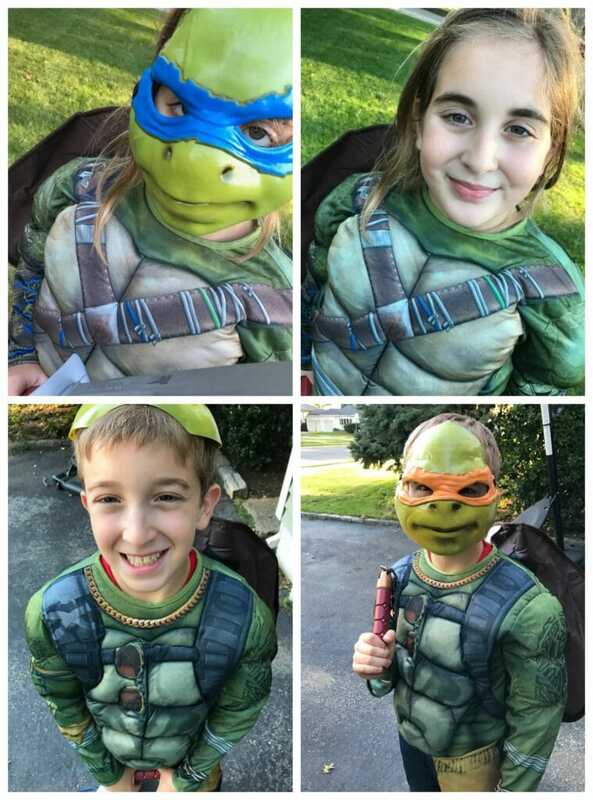 Together we created our very own Ultimate Turtle Team with great costumes from Target! Get the cowabunga kicking started with our Teenage Mutant Ninja Turtles Leonardo Costume. TMNT fans will love dressing up as the super-smart, ninjato-carrying Leo in this TMNT outfit that’s great for Halloween or action-packed playtime. 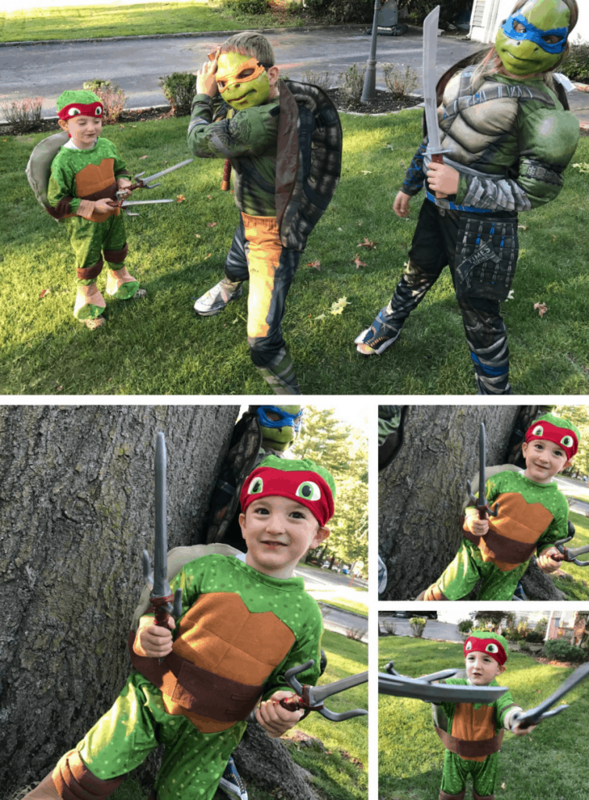 Little dudes will love dressing up as the rebellious sword-carrying Raph, in this TMNT toddler outfit that’s great for Halloween or play time. Anyone can be on your Team—Mom, Dad, Brother, Sister, even a group of friends or coworkers. The more the merrier! I love to see friends try to dress up as a group. Try to coordinate best buds this season and watch them take trick or treating by storm. Whether you are looking for turtle costumes or Halloween party supplies, head on over to Target and Target.com to check out their wide assortment of available products. I found accessories for the kids’ costumes (like swords and nunchucks) and also scored a few Christmas TMNT presents on sale! I’m someone who likes to shop ahead because I always look for the best price I can find. Now is the time to start your holiday hunting. The holiday countdown has begun! My husband and I actually have an adult Halloween costume party to attend this year and I was going to try to DIY my costume. After looking at what’s available at Target, I feel like I am just going to pick up a couple’s costume and call it a DAY. Literally something for everyone this Halloween season- all in one place. My two sons and my daughter loved their Halloween trial run. 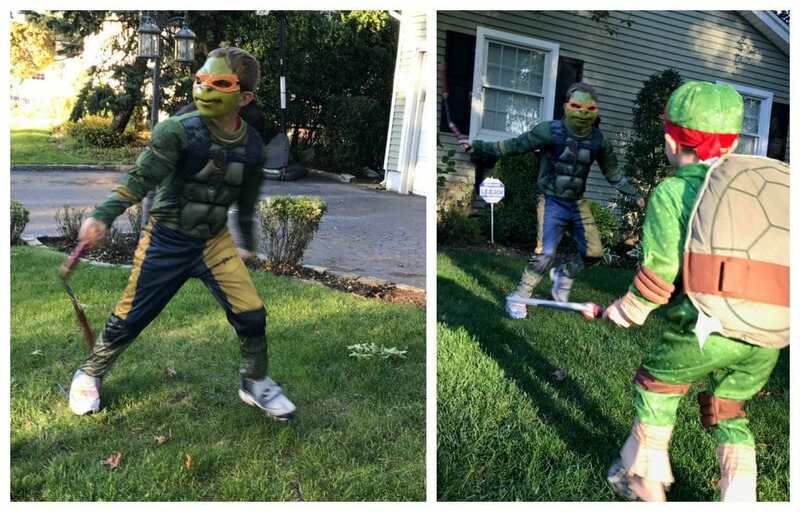 In fact, it was hard to get them OUT of these Teenage Mutant Ninja Turtle costumes. The weather is still on our side. So, I let them all stay outside for a while and have a little adventure while pretending to be their favorite hero in a half shell. Superheroes come in all different shapes, gender and sizes but one thing is always the same – the size of their hearts. Go get ’em gang!!! These costumes are adorable!! I love that Teenage Mutant Ninja Turtles are back!! They were my brother’s favorite growing up!! I so remember the Ninja Turtles growing up. It was funny when I had my son and man years later he loved them. I’m a Target lover, they always have cute costumes. These costumes are great! I used to love watching TMNT with my nephews when I was younger. Hope they enjoyed their adventures! Not believe we are that close to Halloween! I keep forgetting to get a costume for my son ( I know mom fail), I cannot wait to get a costume for him. My son is so into the whole TMNT franchise! 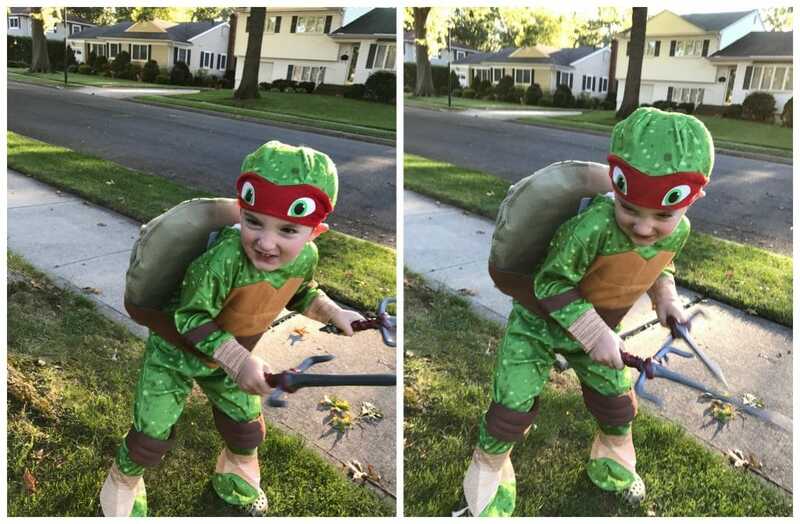 He went as a Ninja Turtle for three years in a row! I grew up watching Teenage Mutant Ninja turtle and was in love with the cartoon. I like that they have now come back out for the younger generation to enjoy. These are the coolest costumes. I’m loving those shells! You definitely have to go as a group when dressing as the TMNT. Those costumes are awesome, my nephew would love them for Halloween! He’s crazy about the ninja turtles. I think his favorite is Raphael. It’s so cool that we grew up watching these cartoons (they were my favorite when j was growing up) and kids today still love them. I loved Ninja Turtles – I think it was because of the old arcade game back in the day and then watching the cartoon! What do your kids think of the new movies? Oh wow TMNT what memories. My brothers use to love this show and dressed up like them several years ina row. Gotta love heroes on a halfshell. Wow.. these costumes are so cool! I can’t wait to get a costume for my nephew. These are wicked cool costumes! I love TMNT and it’s awesome that your kids love them. These are characters that I grew up with and my kids did too. I’m glad the costumes are comfy as well.